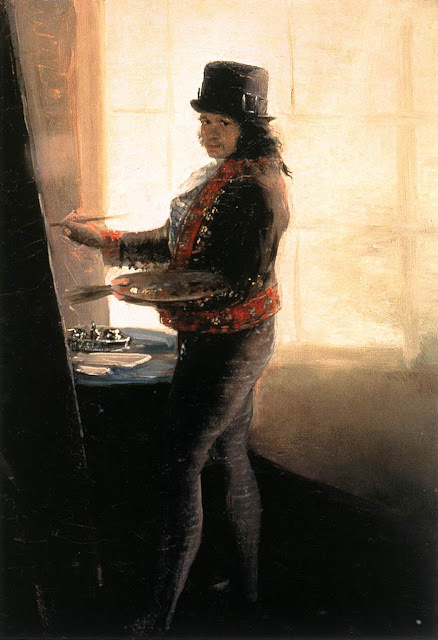 This is Fransisco Goya, most famous for Los Fusilamientos del Tres de Mayo 1808. I am thinking of buying a reproduction of this painting, mainly for its playfulness but also because of the following poem by American poet Billy Collins. from painting The Blinding of Sampson. addressing a canvas tilted back on a tall easel. a device that allowed him to work into the night. as if you were a walking dining room or concert hall. any biography of Goya or to memorize his dates. the hat on his head, ready for a night of work. the laughing like a birthday cake when she saw the glow. with all the shadows flying across the walls. one dark night in the hill country of Spain. "Come in, " he would say, "I was just painting myself,"
illuminated in the blaze of his famous candle hat.